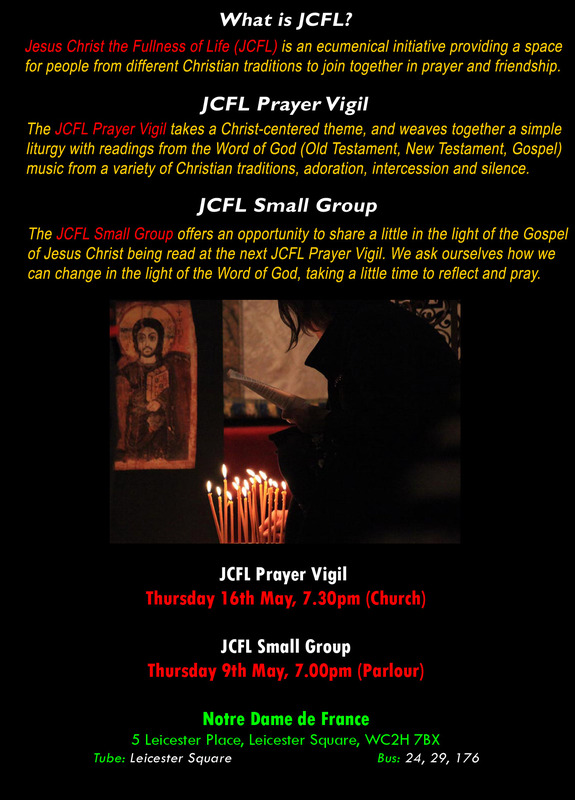 All are welcome to the next JCFL Prayer Vigil taking place at the Church of Notre Dame de France (Leicester Square) on Thursday 16th May 2019 at 7.30pm. The theme of May’s JCFL Prayer Vigil is ‘Behold your Mother‘. The JCFL Small Group meets a week before the JCFL Prayer Vigil at 7pm. The evening provides a time of faith-sharing reflecting on the Old Testament, New Testament and Gospel readings being proclaimed at the next JCFL Prayer Vigil. We ask ourselves how these words of Sacred Scripture can shape our lives and take a little time to pray in the light of the Word of God. Traditionally, after faith-sharing we share a little quality time together, perhaps over a meal, providing an opportunity to build friendships rooted in the love of Christ. We are currently meeting for the JCFL Small Group in a Parlour at the Church of Notre Dame de France. If you would like to join us or would like a little more information on the JCFL Small Group please email info@jcfl.org.uk. Thank you! All are welcome to the next JCFL Prayer Vigil taking place at the Church of Notre Dame de France (Leicester Square) on Thursday 4th October at 7.30pm. The theme for October’s JCFL Prayer Vigil is ‘Rebuild my Church‘. If you would like further information on any aspect of JCFL please contact us. Thank you! The JCFL Small Group meets a week before the JCFL Prayer Vigil. We ask ourselves how these words of Sacred Scripture can shape our lives and then take a little time to pray in the light of the Word of God. Traditionally, after the faith-sharing we share a little quality time together, perhaps over a meal or just a drink, providing an opportunity to build friendships rooted in the love of Christ. We are currently meeting for the JCFL Small Group at the Church of Notre Dame de France. If you’d like to join us or would like a little more information on the JCFL Small Group please just let us know at info@jcfl.org.uk. Thank you! All are welcome to join us for the JCFL Prayer Vigil at our new venue, the Church of Notre Dame de France, 5 Leicester Place, Leicester Square, London WC2H 7BX at 7.30pm. The theme for May’s JCFL Prayer Vigil is ‘Queen of Heaven’. The theme for October’s JCFL Prayer Vigil is ‘Become like Little Children’ giving us the chance to reflect on how we need to change to gain access to the kingdom of God. All are welcome to join us at the Religious of Mary Immaculate, 15 Southwell Gardens, Gloucester Road, SW7 4RN at 7.30pm (6.30pm Song Practice). The theme for May’s JCFL Prayer Vigil is ‘Here I am, Lord’ giving us the chance to reflect on what it means to entrust everything to Christ. The theme for July’s JCFL Prayer Vigil is ‘God is Love’. All are welcome to join us at the Religious of Mary Immaculate Hostel, 15 Southwell Gardens, Gloucester Road, SW7 4RN at 7.30pm (6.30pm Song Practice) for an evening of prayer and friendship in Christ. April’s JCFL Prayer Vigil is taking an Easter theme, ‘The Road to Emmaus’. All are welcome to join us at the Religious of Mary Immaculate Hostel, 15 Southwell Gardens, Gloucester Road, SW7 4RN at 7.30pm (6.30pm Song Practice).